Item's Dimensions: 48" x 46"
Description: Realist Lisa Dinhofer constructs a compressed, imaginary space then fills it with precisely painted objects. The result is fascinating--if slightly disorienting. 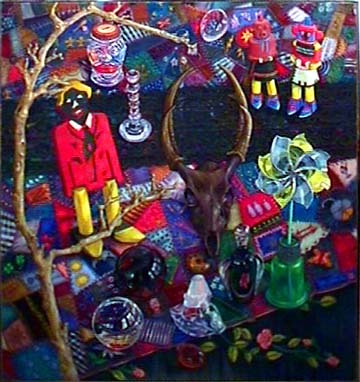 This painting entitled "Americana Crazy" includes mythic American memorabilia: crazy quilt, carnival pinwheel, glass bank, kachina dolls, puppets, deer skull, etc., etc. 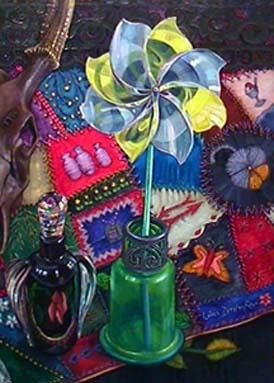 View more details of this precisely painted work: pinwheel detail and glass bank detail. Lisa Dinhofer teaches drawing at the National Academy of Design (NYC) and is represented in collections including: New York Public Library, Brooklyn Museum, IBM and Pfizer. Lisa Dinhofer's 90 foot "Marbles" mural for the New York City MTA subway station (42nd Street and 8th Avenue) unveiled in May 2003. Visit the Soho studio of illusionist painter Lisa Dinhofer. 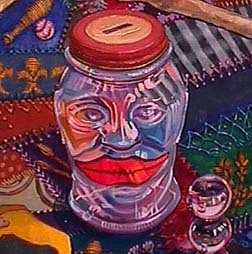 View additional still life paintings, drawings & mixed-media works on paper by Lisa Dinhofer.